This is hands down one of the weirdest things I've seen in a shop so far. You gotta give a hand to these guys. I don’t know if they got it off someone they caught stealing red-handed but just seeing it displayed so prominently gives me a shake. I’m surprised that the no authorities have asked them to hand it over just to check it for fingerprints. Though considering they are weapons dealers, I wouldn’t be surprised if it came to fisticuffs over anyone laying a hand on their prized possession here. Okay, okay, okay. I’ll stop with the terrible hand jokes, but this thing did make me do a double-take when I first saw it. Just goes to show you that you haven’t seen everything yet. Sitting on the counter is a prosthetic arm in an elaborate jar. Do I even need to repeat that? I don’t even know where it came from. All of the employees seem to have all of their limbs firmly attached, and it doesn’t seem to be any kind of fist weapon. If it is, I severely doubt it’s usefulness. The best part is that every now and then it twitches! Now I have to know where this thing came from. I imagine there’s probably a great story behind it too. Wouldn’t you think? Granted, my mind jumps to thoughts of Reservoir Dogs, but I’m sure everyone has met a relative or someone missing a body part. There’s always a story to go along with that. And this thing is in a jar! A jar for pete’s sake! 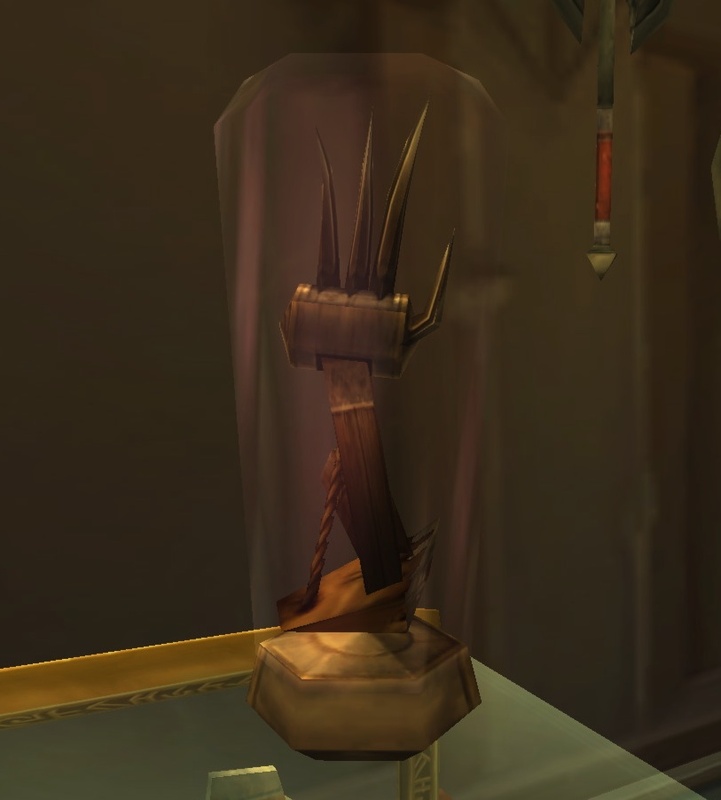 There are lots of things in the game that come in jars, but none of them get me as fascinated as this thing. It could be Tyr’s missing hand, or maybe Vezax’s other hand, or maybe both! The most likely story is that it belonged to some unfortunate soul you questioned the quality of the store’s primary product: Big sharp things. The store probably held on to it as an example of exactly how top notch their blades are. Is that something people are really proud of? “Our weapons are so sharp, they severed someone’s arm off while they were window shopping!” While I will admit that is a great endorsement for how sharp your big sharp things are, I don’t think that it’s a successful way to drum in new business. I don’t know too many people who go out shopping thinking that the place that someone got crushed by giant television is the best place to peruse. Maybe they’ll just stick with Amazon, or a store that doesn’t stack their TVs so hazardously. Posted on April 4, 2010, in Northrend, Oddities and tagged bad jokes, Dalaran, hand, puns, severed. Bookmark the permalink. 5 Comments. Makes me kinda wish for a sec that DK’s could use fist weapons… dual wielding two of those… things… would make for a pretty sweet tanking look. .-= Artie´s last blog ..What I’ve changed with 3.3 =-. It looks like a hand from a harvest watcher to me. It’s actually from the Compact Harvest Reaper model: http://www.wowhead.com/spell=3963#.